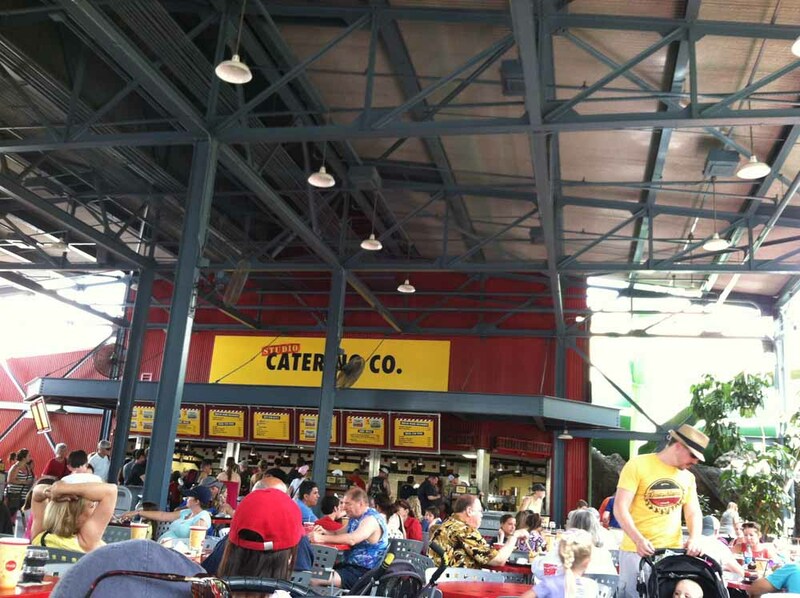 We spent the second day of our Walt Disney World vacation walking around Disney’s Hollywood Studios, a place that had great food at both the counter service and sit down levels. For lunch we hit up Studio Catering Co. which is supposed to be set up like the commissary of a studio, but, you know, right around the corner from Star Tours and butting up against the Honey I Shrunk The Kids playground (which is a childhood favorite of mine). The way places like this work is that there’s a menu posted up high where everyone can see it (those yellow signs in the above picture). When you know what you want, you approach one of many very nice people standing at a computerized register. 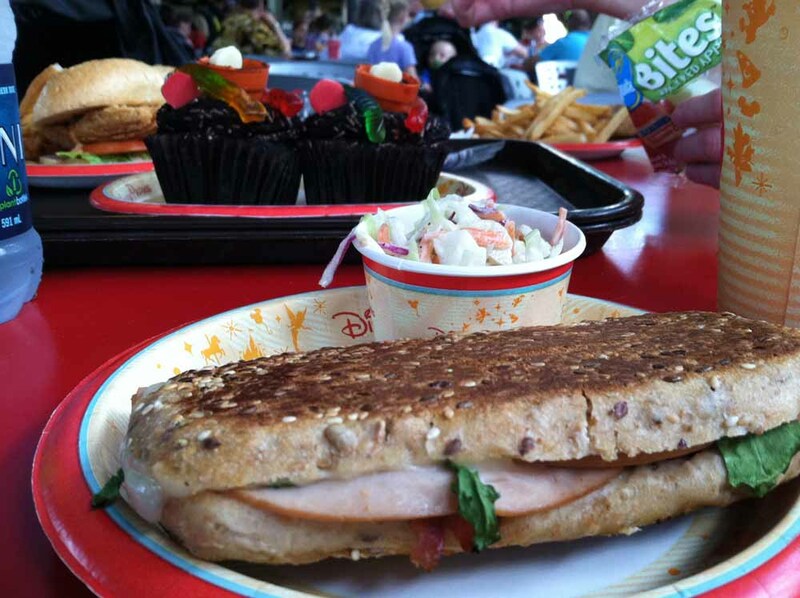 Once your food is ordered, you move up and pick it up from the people working in the kitchen and prep area, so it’s a little nicer and more organized than your average cafeteria, which you’d expect from Disney. For lunch I went with the Pressed Turkey Club which includes “Turkey, Applewood-smoked Bacon, Swiss, Roasted Red Pepper, Arugula, Multigrain Ciabatta Bread.” It was a really solid, tasty sandwich that didn’t feel like something slapped together. It seemed well thought out and well balanced. I also got the cole slaw which was better than average and think I even had a little cheesecake dessert, though the for-a-limited-time-only Worms & Dirt Cupcakes you see in the background were enjoyed by my family. That day we had dinner at the Sci-Fi Dine-In Theater which is a fun place where you actually sit in tables that look and feel like old school convertibles. Those car-tables are “parked” in an area that’s set up like a drive-in theater complete with a movie screen running film clips, cartoons and trailers of stuff from the 40s, 50s and 60s. 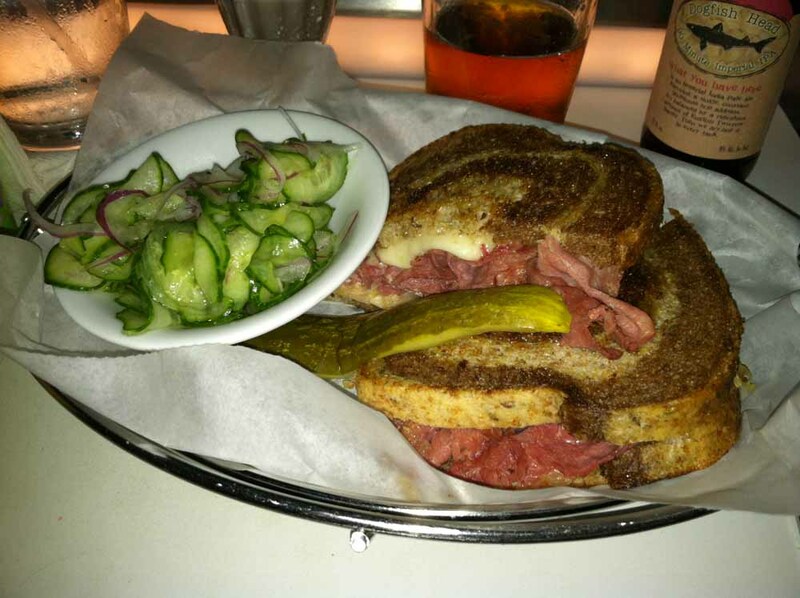 We weren’t sure if the atmosphere — which was fantastic — would outshine the food, but I really enjoyed the Reuben I had. You might think that a sandwich with such basic ingredients (corn beef, Sauerkraut, Swiss cheese, Thousand Island dressing and rye bread) would be difficult to screw up, but that’s not been the case in my experience. For one thing, you can find a wide spectrum of quality in just those five things, but the way a place treats their corn beef is also really important. The Sci-Fi Dine-In seems to treat its beef really well because the meat was nice and juicy and not dried out at all. In fact, all the ingredients felt top notch and tasty. I’ve probably had better Reubens in my life, but not while sitting in a fake car watching trailers for Plan 9 From Outer Space and Attack Of The 50 Foot Woman. Oh, the cucumber salad was actually super tasty as well, it was a kind of sour, pickle-y alternative to fries if that’s something you’re looking for. Next The Pop Poppa Nap Cast Episode 10 – FIXED!